ThinkGeek is the premier retailer for the global geek community featuring exclusive and unique video game and pop culture products. 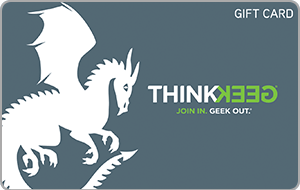 ThinkGeek offers a hand-curated assortment of 5,000+ of the geekiest gadgets, electronics, toys, collectibles, housewares, apparel, and accessories available anywhere in the world. The ThinkGeek mission is to create a world where everyone can embrace their inner geek and connect with one another. This eGift Card is redeemable only for the purchase of merchandise only in the U.S. at GameStop, ThinkGeek, EBGames, Babbage’s, EBX, and Planet X stores and online at GameStop.com and ThinkGeek.com. Card does not expire or impose any fees. Except where required by law, it may not be returned, redeemed for cash, or applied as payment on any account, and will not be replaced if lost or stolen. Not responsible for unauthorized use. This card is not a credit card or a debit card and carries no warranties, express or implied. This card is issued by and represents solely the obligation of Marketing Control Services, Inc. (a Virginia corporation), which reserves the right to change these terms and conditions at any time. Use or acceptance of this card constitutes acceptance of these terms and conditions. To obtain your card balance, call 1-888-818-2915. Purchases of gift cards never count towards promotional totals (e.g. $10 off of $30). In order to take advantage of those promotions, customers must buy merchandise. Purchases of gift cards do not accrue PowerUp Rewards Points or Geek Points.